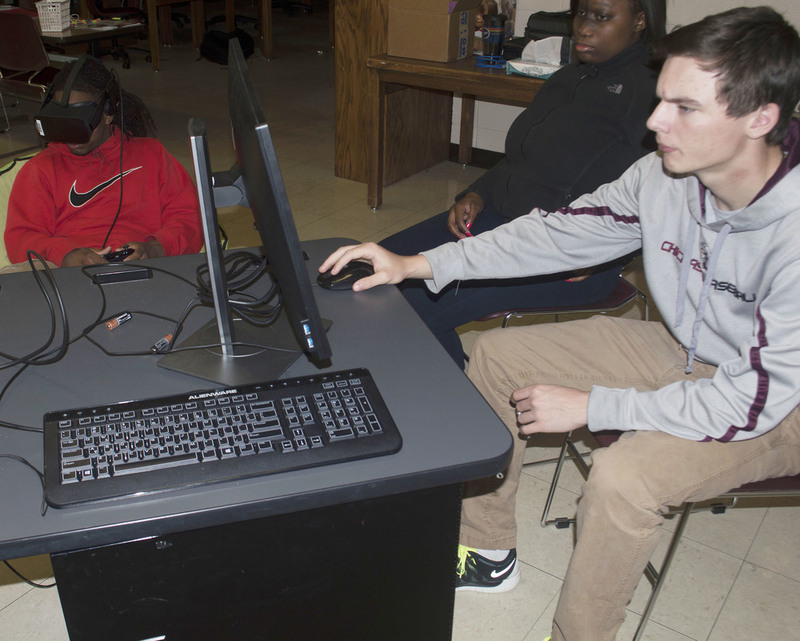 Blytheville High School student Seane Clifton tries out the BHS Virtual Reality system during recent training, with Calup Hedger watching what Clifton is doing from the computer. Meanwhile, BMS eighth-grader Cody Myers (not pictured) prepares to “travel through a museum” on one of the apps downloaded to the school’s VR system. Blytheville High School and Blytheville Middle School are in the beginning phases of a program that some teachers believe has unlimited capabilities. This is another way of saying that what computers have meant for public schools in the last 25 years, “Virtual Reality” could mean for education in the near future. “The Blytheville School District has been on the front line of using technology in an effective way to provide relevant 21st century learning to all our students, and this is one more way to make sure they have access to great learning opportunities”, according to Curriculum director Sally Cooke. Wicker brought out that Virtual Reality will give BHS students the opportunity to see and explore things that, if not for improvements in technology, they would have been unable to before. Virtual Reality involves a student wearing a headset complete with stereo sound, and then taking himself/herself through educational, and even entertainment, settings that are as vast and limitless as that person’s mind. While TechStart is the support community, Oculus is the VR manufacturer and also has a website that allows Wicker and Rutherford to download free, age-appropriate educational programs. Some of the programs Rutherford already has include a walk through a museum, where the person encounters a T-Rex that actually investigates him/her and then walks right past the person, “The Night Cafe” with Vincent Van Gogh, a rollercoaster and a VR ride through the Grand Canyon on the Colorado River. All this time the teacher is monitoring that same program on the computer. Wicker, the CTE instructional leader, said that one of the apps, “Incell”, takes students through the cell of the human body and allows those students to see the human body as never before. Other apps she is excited about include “Cat Flight” and “Discovery VR”. Created by BBC Earth, Cat Flight is the story of a mother caracal and her kitten trying to find food in a desolate African desert. For more than 30 years Discovery has told stories like no one else — transporting persons to places he/she didn’t know existed and sparking curiosity at every turn. Wicker has been using Virtual Reality in her business classrooms for the last few weeks to allow her students to become more familiar with it. The kit also comes with a 360-degree camera that can be placed in the middle of a room, allowing students to complete projects. The camera itself is so new that Wicker is not exactly certain what kind of impact it will have on students’ education. Tyler Isbell, technical integration specialist, and BHS science instructional leader Jared Swenson are the other two teachers that were instrumental in the writing of the BHS grant to acquire the VR kit. The VR kit is priced at approximately $3,000 for the headset, controllers, software and camera, but Rutherford believes that as Virtual Reality becomes more plentiful in schools, the price will come down. The BHS and BMS educational apps are free, but some apps range in price from two dollars to $99. The VR program, however, will be limited at BMS to eighth-graders because, added Rutherford, data shows that until approximately age 13 students’ minds and vision are still developing, hence the need to keep the younger students from experiencing VR until their last year at BMS.